This month’s Poppins Book Nook topic is Feasts. We went a little bit off the beaten path with this idea and chose a fun wordless picture book depicting an animal feast called Foxly’s Feast. Yes, I know it is a stretch, but when I saw this book I knew I had to share it. I love wordless picture books and think they are excellent choices for reading (see our The Benefits of Wordless Picture Books to find out why.) This book is wordless, is about a feast and is one I really think kids will enjoy. Author David Owen says he grew up drawing and always wanted to be a children’s book author/illustrator. How neat is that? I love when a young man has a passion and is able to follow it to fruition. Today we are taking a look at this lovely book about feasts and we also have a fun food activity to share. Foxly’s Feast is a delight. It pulls you along to the end because you just have to know what happens. see the book here . The story starts out with Foxly, who is oh so hungry. He sets off to find something, anything, to eat. While he finds some groceries this doesn’t seem to be enough. A hungry fox and a forest full of adorable animals certainly makes you wonder, doesn’t it?! But, no worries, as this book has an ending everyone will love. The illustrations are wonderful. The book is a visual feast (really!) You really need that with a wordless picture book. I love his illustration style and am interested to learn more about his technique of scanning and coloring in Photoshop. When I was looking into that I found this article where you can learn to draw Foxly! David Owen kindly put together a drawing lesson for drawing Foxly. Totally worth checking out. I have to admit that I am becoming a bit obsessed with fun food. As soon as I saw that the topic was feasts I thought perhaps I could make a fun food activity to go with a book – and that is exactly what I did. Do you like him? I was told he is almost too cute to eat! While I am having a blast creating fun food, I always want to make something that kids can do themselves. I want cooking and getting into the kitchen to be a fun activity. This fox could not be easier. He is simply made from whole grain white bread and Apricot Jam as well as three Black Pearls ! I wanted a smooth look to my fox so I used the jam brand in the link. You can try whatever you have on hand. I used a scissors to cut out the fox’s head. Make it into a heart shape and go straight across at the top of the head. Cut out two pointy ears. Make them longer at the bottom so you can slip them under his head. I moistened the bottom of the ears a little bit and stuck them to the back of the head. They stick pretty well. Cut out a tail shape. From the bottom of a slice of bread, cut two straight lines and then expand out a bit for his body. Make it a little bit wider toward where the head will attach. The crust will make his little feet. Cut a small strip out between the legs. Press down the wider part of his body where the head will attach. You pretty much smash it flat so the head won’t stick up too far. Also press down just a small spot where the tail will attach. Don’t put jam on those parts. Next, spread apricot jam on the fox as shown. Leave two white strips on his face, two white strips at the bottom of his feet, and the tip of his tail uncovered/white. Then assemble your pieces. Lightly moisten the back of the fox’s head to attach it to the body. Do the same with the tail. Add two of the black pearls for the eyes and one more at the tip of his nose. It seems like a lot of directions but just read through once and you can make him. I wanted to add in details in case you wanted to know what I did to make the fox. 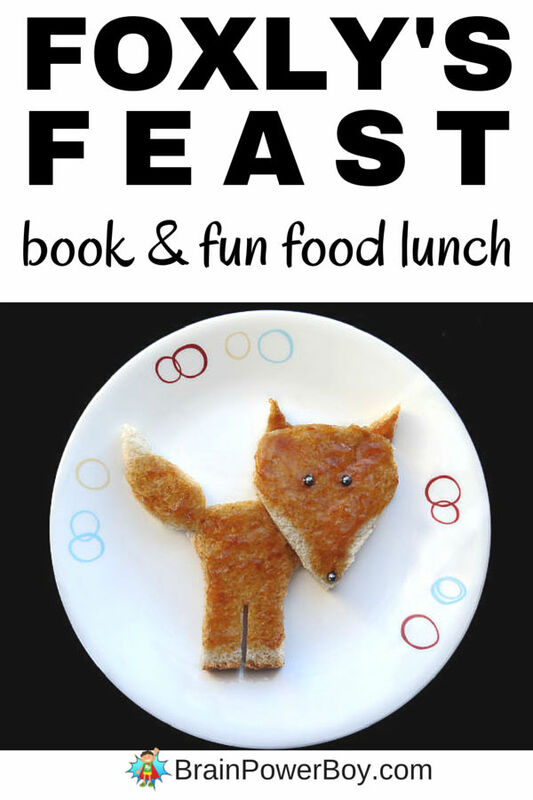 I hope you enjoyed the book choice for this month, Foxly’s Feast, and that you will give our fun food fox a go. See also: Fun Food for Boys and Wordless Picture Books pages. So cute and very creative :). 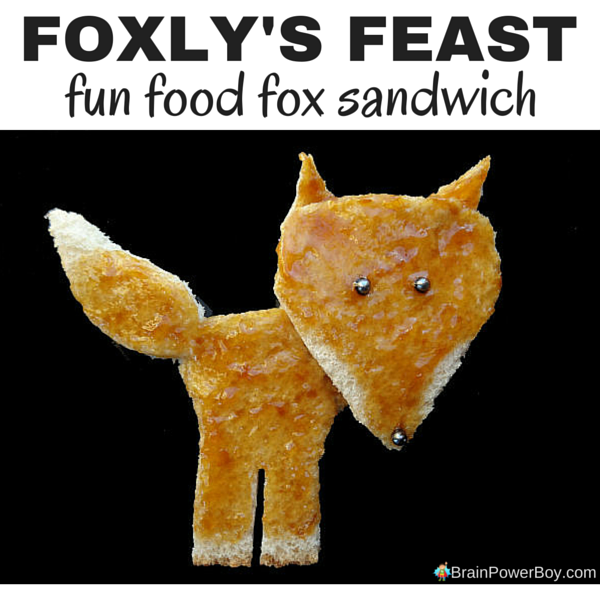 I would never think of creating a fox out of food but I’m sure it would be a hit with the kids. Aw – thanks Melanie. I am a bit taken with all of the fun food. I used to make my son some simple things when he was younger. It is really a lot of fun.